One of the most spectacular areas of Digital Signage are LED installations, which are integrated into all manner of different installations. While simple video walls often display drab and poorly curated content, at the top of the scale, Vanity Walls serve as brand ambassadors for customers and employees. The Champions League of LED installations feature interactive, dynamic video art works – the so-called Lobby Experience Zones. 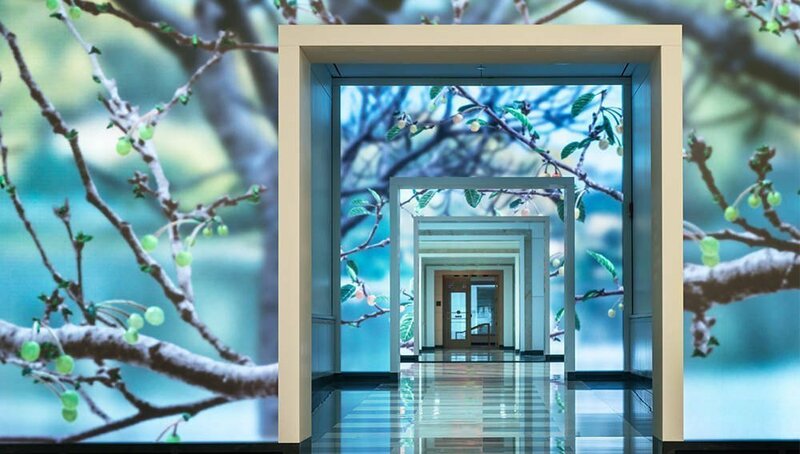 High quality video walls increasingly integrated into architecture have become an eye-catching centrepiece within many corporate headquarters. Like high quality floor coverings, lobby video walls also constitute a key part of the presentation of the brand identity. In addition to DAX 30 companies, tech companies as well as banks and law firms are investing in lobby experiences. In the US, lobby experiences have been established for some time. Interestingly, in business hubs such as New York City or San Francisco, a certain percentage of the costs for new buildings or office extensions must be spent on a public art investment. As a result, high-quality lobby experiences often fall within the arts promotion category. The case at Orlando Airport is similar. At the check-in area, 700 55″ screens over a total length of 475m were installed for signage and video art. Here, too, local regulations require a minimum investment in ‘art’. Further afield in Europe, lobby experiences are also increasingly being installed as part of the corporate architecture. At Adidas HQ in Herzogenaurach, Germany, a huge Samsung video wall with dynamically generated content has been in place for a few years now. Having said that, the content-concept can not compete with the awe inspiring scale of similar US experiences. Also in Stockholm, a video art lobby experience has recently been integrated into the new head office of the Swedish SEB Bank. In addition to video art, dynamic, data-generated content plays an increasingly important role. Exemplary here are the Salesforce Headoffice on Mission Street in San Francisco, Terrell Place in Washington D.C. and the Netflix office in Hollywood. Terrell Place is an established office building in downtown Washington D.C. As part of a thorough renovation of the building, the lobby area was to be upgraded into a zone of experience. The finished product sees animation speed of the visual content change dynamically with the number and movement of people. The potential of such lobby experiences is huge – also here in Europe. We invited Michael Luck Schneider from the New York digital agency ESI-Design as keynote speaker to the DSS Europe 2018 to talk about the topic. Michael is one of the leading developers of lobby experiences in the world.